All marketing definitions focus on the same point: customer orientation and the satisfaction of customer needs. Within this framework, although marketing approach in most of studies primarily deal with institutions and enterprises in profit/private sector, it has become crucial for all kind of organizations including non-profit ones. In recent years, many non-profits have grown larger and continue to improve their growth and effectiveness. In this sense, marketing is touchstone of developing non-profits. This part hopes to create a perspective to marketing definition to understand the relevance of marketing to non-profit organizations and how marketing strategies should be adapted to them for success. It is well-known that there are three main sectors especially in developed countries. These are private sector, government sector and nonprofit sector. As a part of world economic and financial system, rapidly growing nonprofit sector is noteworthy. In particular, the USA and the other developed countries are considered to be the origin and the cradle of the sector but the sector is also spreading in other developing countries such as Turkey in the last several decades. It is observed that very different terms and concepts are referenced in the literature for identification of the organizations of this nonprofit sector from small local associations to extremely large and professionally managed ones. For example, nonprofit organizations (NPOs), nonprofit sector organizations, voluntary organizations, not-for-profit organizations, civil-society organizations, non-governmental organizations (NGOs), third sector organizations, independent sector organizations, charitable organizations, tax-exempt organizations, social movements and etc. are some of those terms which are used to define these type of organizations. Here at the beginning of the chapter it must be highlighted that although the term is commonly in use in the literature, NGOs must be described as a subgroup of NPOs as others. 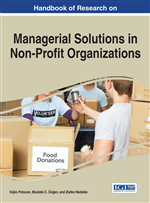 The term “nonprofit organization-NPO” is preferred to use in this chapter for expressing the nonprofit sector organizations because it reflects the exact nature of the concept and has the most common use in the literature of social sciences. The organization has always a social mission that includes public welfare. The organization can generally be one of these types: a corporation, a trust, or an unincorporated association. However, no matter which type it is, the organization must have a not-for-profit structure. It must be inhibited personal financial interest by the organization. Management of the organization must not be based on self-interests of anyone. These organizations do not pay any of federal taxes. They have exemptions. The last but the most important feature that causes wide spreading of this type of organization structures all over the world is their special “tax-deductable” status. This very special feature makes them more attractive because if one gives a donation or a gift to them, it stays out of the scope of tax. According to subparagraph(3): Religious, educational, charitable, scientific, or literary organizations; testing for public safety organizations. Also organizations preventing cruelty to children or animals, or fostering national or international amateur sport competition. According to subparagraph(4): Civic leagues, social welfare organizations, and local associations of employees. According to subparagraph(5): Labour, agriculture, and horticultural organizations. According to subparagraph(6): Business leagues, chambers of commerce and red estate boards. According to subparagraph(7): Social and recreational clubs. According to subparagraph(8): Fraternal beneficiary societies and associations. According to subparagraph(9): Voluntary employee beneficiary associations. Social Needs: The needs that create social value and opportunities for people to have active and effective role in society. Sustainability: The balance or harmony between economic sustainability, social sustainability and environmental sustainability. Product Series: A group of products in the product mix which are associated with each other and they can be obtained for the same type of customers or they are marketable for the same type of market place. Marketing Concept: is the philosophy that firms should analyse the needs of their customers’ stated and unstated needs then take decisions to satisfy those needs, better than the competitiors. Darüssafaka Society: The name of one of NPOs in Turkey.